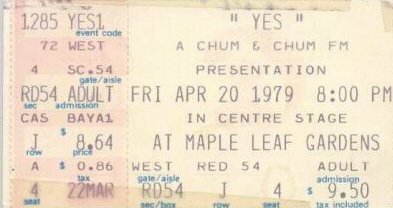 A recording of the Chris Squire interview with CHUM Toronto 1979-4-19 reveals the caller responsible for making the request that caused CTTE to be played, to have been a he rather than a she. Wow, seldom has somebody been so wrong so often in one "review" as Andy T. They absolutely 100% played CTTE, Awaken was dropped instead. They also most definitely played And You And I. There was no "huge reel-to-reel tape machine (that) Jon worked for Damien's part" onstage at all, that taped bit was run by the engineer through the P.A. ANDY T IS WRONG. THEY DID PLAY CLOSE TO THE EDGE. I HAVE THIS SHOW ON TAPE. I was at this show, all those many years ago, and I still remember it fairly well. 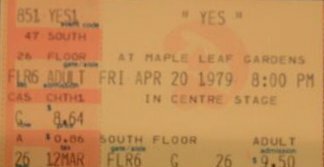 It was significant for me because it was my first Yes show (the second was the dire "Drama" tour show in Toronto - my last), I was 13, and these guys were my heroes. I'd first heard "Close to the Edge" in '74 and fell in love with it. 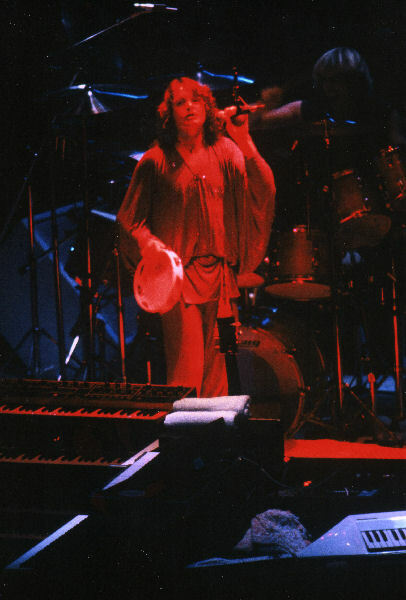 This tour, however, pretty much ended what little was left of the "classic" prog rock era. * The tour song was kind of a nuthin', but I still remember the refrain: "Toronto... Maple Leaf... Canada!" I still love the old music and admire the musicianship, but I just haven't been able to bring myself to see these guys again. It's fun to reminisce, but the Seventies are over, folks, and they ain't comin' back. On a Toronto radio visit the day before the show, Chris Squire promised to play CTTE (at the request of a female fan calling in). He kept his word, and CTTE replaced Awaken in this show. It is too many years later to give you a blow by blow account of the show. All I can tell you is that it changed my life. 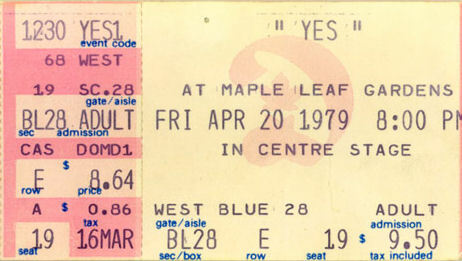 I was 15 years old and had only discovered Yes in hearing Going For The One. At the time I was wearing out my copy of Tormato. As the days before the show counted down, my excitement grew to nerve racking limits. My friend Dino had bought the tickets. Sadly the concert fell on Greek Easter and his father forbade him to attend the concert. To this day he has not quite forgiven me for being there that night. I ended up going with a friend from England who was aware of Yes, but not a Yes Freak. I remember the smell of weed hitting me like a brick wall as we climbed to our 3rd row Grey seats. (Very, very high up in the Gardens.) The "In The Round Stage" was clean and as the speakers were suspended high above the stage there seemed to be clear site lines from all angles. As I recall I was at the time not familiar with their earlier work. Roundabout and All Good People being the exceptions. I have only vague memories of blissful moments, almost entranced listening to the band. Jon''s soaring voice, Introductions for songs I knew and didn''t know. My fave at the moment was Circus of Heaven. As Jon introduced it I remember leaning over to my friend and saying this is my favorite. He Replied "Sit back and enjoy." It was then that I realized I had either been leaning forward or standing most of the night. I remember taking in the darkened Gardens with lighters lit, (and fans lit), and Yes bathed in lights. The sound was great. Being a veteran of many, many Maple Leaf Garden concerts since, I really believe the speaker set up in the centreof the hall limited the echos that ruined many other shows later on. The bottom line is that we left in a semi-dream state and drifted with a silent throng past our bus stop and on for about a mile before we remembered that we needed to get home. A super show, and a landmark in my life! Thank you very much, thank you. It's really good to be back in Toronto one more time at the ole Maple Leaf. We'd like to carry on with one or two songs from last year's album 'Tormato'. A song called 'Future Times/Rejoice'. Thank you. Next song leaves a little room for the imagination. A song about the day the circus of heaven came to town. Thank you so much thank you. As you know, it's..uh our anniversary year. Been now ten years, I mean..and because we've been coming here for quite a long time it's, it's our anniversary together and when we get together again. So we put..we put together one or two songs that you might remember. Woo! Thank you very much. Thank you. I'd like to introduce to you on acoustic guitar, Mr. Steve Howe. Let's hear it for Steve Howe. After due consideration, we de..decided that we'd like to try this song tonight. And now something that somebody has been waiting for out there, at least one or two people. To be entertained by the marvelous knees of Mr. Rick Wakeman. I'd like to thank you for coming along this lovely evening. I'd like to thank you one and all for coming along this lovely evening. I'd like to thank you everybody for coming to see me. We hope you had a good time. For coming along this Friday evening. Toronto, Maple Leaf, Canada, Canada. Toronto, Nous Sommes Du Soleil. Canada, Canada. It's very good to see with you.